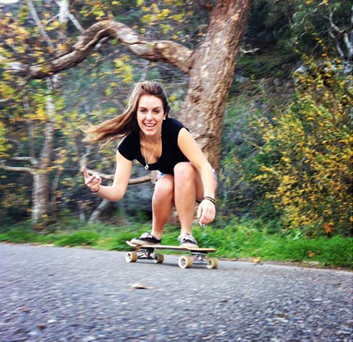 Carmen_sutra can ride skateboards of all sizes. 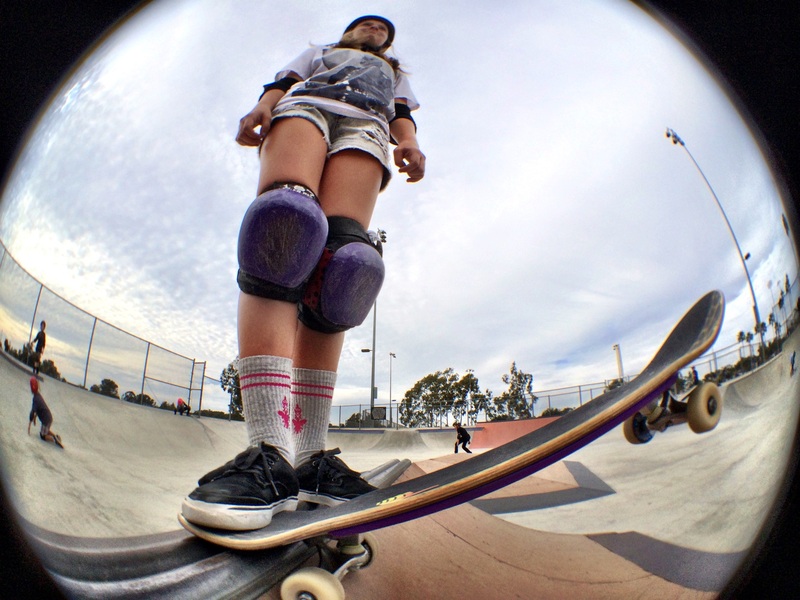 I like that – the pictures of her skate adventures are incredible. I appreciate that she loves all skateboards. There is such a thing as favorite wheels. If you have a skateboard with wheels you love and over a period of time they have consistently performed– it is totally ok to consider them your favorite wheels and you can ride them until they don’t roll anymore. Yes even if some people are like “WTF is up with those wheels” – if you like the feel of the wheels keep them on your board. I also believe it is not a waste of money to have several boards that you ride depending on what you’re riding. You’re blessed if you can have several boards. With clothes you should never wear ill-fitting ones. And with boards and wheels it’s the same thing – if it feels wrong for you it’s wrong – if it feels good to you – ride on. 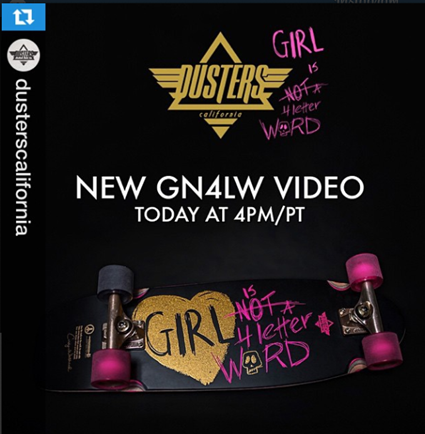 Thanks Carmen for sharing the rad shot and showing girls can skateboard! This is what it’s all about – staying true to yourself while skateboarding. This is her first lesson and I love that she’s dressed for the occasion. I get hate messages – like yesterday’s “skating and fashionista are two words that shouldn’t be used together” – which is not a quote more a paraphrase because I took out the swear words. 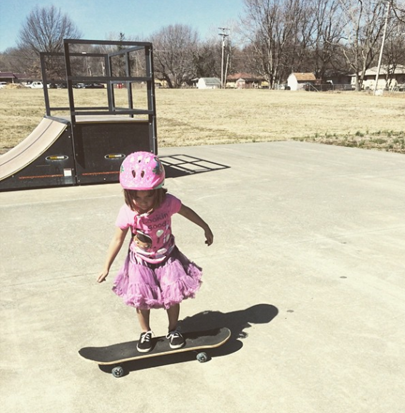 Not everyone should be out there skateboarding in pink and/or lilac. Obviously not everyone looks good in those colors – never wear a color that doesn’t complement you. To my new friend, who’s just starting out – keep it up – and don’t change who you are or what you wear to skate. 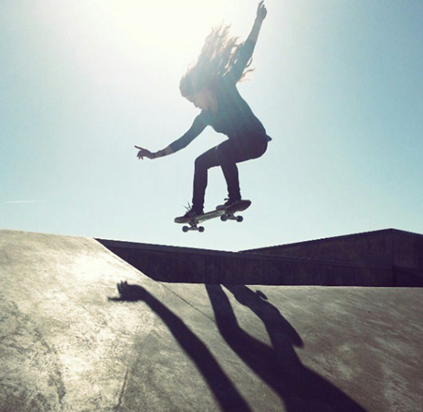 Skateboarding is about having a sport that allows you to express yourself and have fun. Till next time stay fashionable and friendly. And good job coffeemomma1981 for being a positive encouraging role model to your daughter. Are Bombas Socks Better for Skateboarding? Recently I received a catalog that encouraged the wearing of socks with sandals. I won’t be sporting that look. Not all style tips are valid. When I’m wearing my skate shoes, I will be wearing socks. As a fashionista I like how Bombas socks look, but does that make them better for skateboarding ? Bombas socks don’t fall down and they’re comfortable plus they don’t cause friction blisters all of which makes my feet happy and I skate better with happy feet. Seriously I’ve observed that people skate, run, and even walk better with happy feet, while people with sore, mad, cranky feet tend to spread doom and gloom. So I’m endorsing wearing comfortable socks as a way to spread joy and improve sports performance. Note this is not scientifically proven or an always – could be some people with sore, mad, cranky feet are just so pumped on adrenalin they have super sports powers. Another way Bombas socks spreads joy is that for every sock bought a sock is donated. Where I live people take socks for granted. Of course some disappear in the drier or get stolen by little brothers or daddies, but for the most part socks are a given in my community. In some communities socks are in need. Bombas answers that need. I’m proud to support a company born out of a mission to help those in need. I absolutely agree with Bombas, that we’re all connected and little improvements can add up to make a big difference. It’s always fashionable to connect and help others. It’s also fashionable to change your socks regularly – smelly socks are never in style. Till next time – wishing you happy, fashionable, stink-free feet both on and off the board. 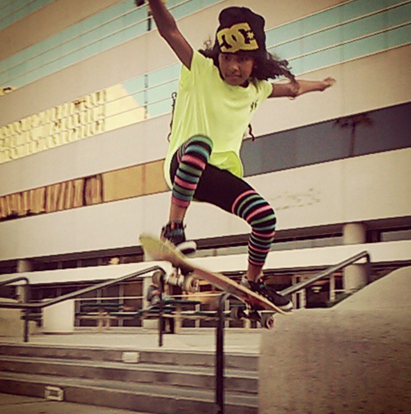 Stripes and skateboarding have something in common – people fear them for no reason. 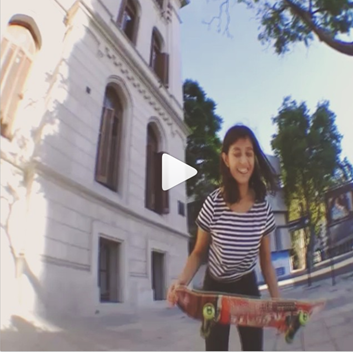 I say be brave like Ana Laura Garcia from Buenos Aires in Argentina. She looks amazing in stripes especially as she airs over stairs. Check out her video for day and night clips. When and where do you like to wear stripes? I agree with Teen Vogue that stripes are sporty check out their article for inspiration on how to wear stripes. So till next time keep it fun and fashionable on and off the board! 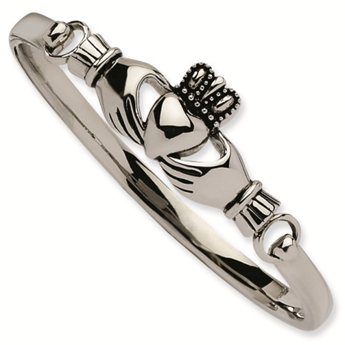 The Claddagh ring represents love, loyalty, and friendship. The hands represent friendship, the heart represents love, and the crown represents loyalty. On this St. Patrick’s Day I’m wishing you all those blessings. As for skateboarding with rings – small, silver, and maybe layered is what I’m loving right now – till next time keep skating and keep it fashionable.